Those kind of “cigarettes” would probably be some nasty smokes: That “leftover” is, more or less, the “filter” of the cigarette – plus the staleness of that smoke in the tobacco, coupled with three of them (and the final one being the new “filter”) – that just seems wrong on many levels, and I’m not a smoker! 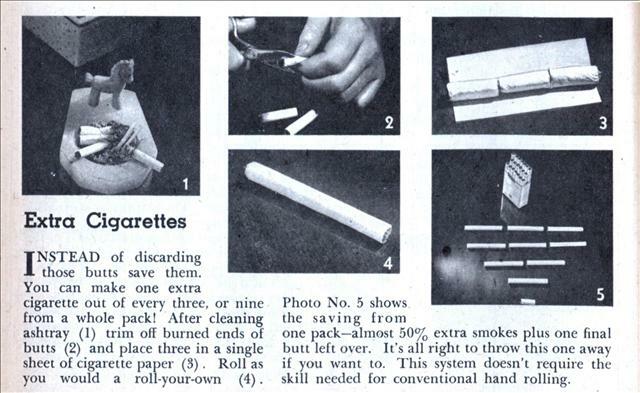 If you kept doing this with the “butts” leftover, you could get another 4 cigarettes (and two leftover butts) – and if you were real desperate, you could save those two for the next batch – the whole cycle just sounds completely nasty and wrong (from a taste perspective, which is what tobacco smoking is arguably about – arguably – right). Ugh. Hey, you’re not a real smoker until you’ve recycled the ashtray when the shops are closed! As an ex-smoker, I can’t imagine now how I ever did anything so disgusting (the resultant smokes tasted absolutely foul, though incredibly strong), but it shows you that the old slogan “I’d walk a mile for a Camel” grossly understates the determination of the jonesing smoker. Walk a mile? I’d have crawled it over broken glass! This ad seems ten years too late. A few years ago on one of my bike trips I saw a guy unrolling butts into a pipe and smoking it – that would have been REALLY nasty.